How was the Real Estate Market in Austin for 2012? The real estate market in Austin, TX saw incredible growth in 2012. After an extremely busing January, I finally had time to put this information together and wanted to get it out as soon as I could with it being late already. The graph below gives a good summary of most of the information I have put together. In 2012, the number of homes sold increased 19% to 10,406 from only 8738 in 2011. The average sales price increase was equally as impressive – in 2012 the average sale price was $342,206 versus $320,868 in 2011, a 6.7% increase. In 2012, the average price per square foot grew to $145.72, a 5.9% increase from the $137.58 average price per square foot from 2011. While each of these numbers illustrate the rapid change in the Austin real estate market in 2012, none are quite as significant as the average time a home was on the market before it sold. The average days on market shrunk to only 52 days in 2012, a 27% decrease from the average 71 days in 2011. 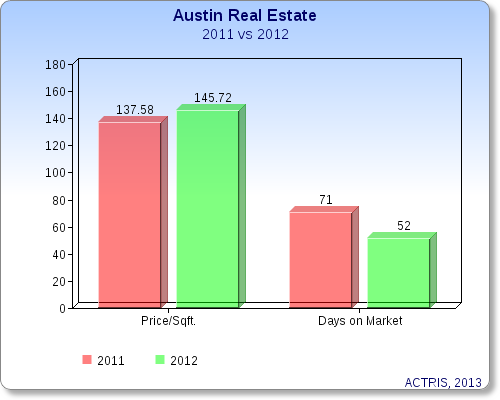 What do these numbers mean for you if you are looking to buy or sell a home in Austin in 2013? If you are looking to buy a home, home prices are rising and inventory is shrinking, meaning that you might pay more than in 2012 and have less options. Because homes are selling more quickly, you should also move fast to put a strong offer in once you have found a home you really like. If you potentially looking to sell you home in Austin this year, your equity has likely grown and there is likely a strong demand for your home. You have chosen a great time to sell! Drop me a note to learn about how my progressive marketing plan can go to work for you!